In the third and final T20 match against Pakistan and New Zealand , Abdul Razzaq was the star in a consolatory 103 runs victory against New Zealand. 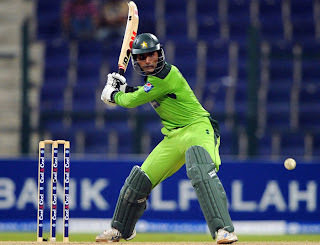 Pakistan playing for a face saving won comprehensively as they bundled out hosts for 80 runs, while Abdul Razzaq shone with both bat and ball, scoring unbeatable 34 off 11 balls , and took 3-13 as he ripped through Black Caps. Captain Shahid Afridi who had failed with the bat once again, produce a sensational 4-14 vicious spell.This was New Zealand lowest score in T20's, and also was the fourth biggest defeats registered in T20I history. Batting first, Pakistan started off pretty well, with Ahmed Shahzad who played some nice strokes as he raced to his fifty, when ten boundaries. He along with Hafeez was also playing with authority, as they posted a partnership of 81. After both openers dismissed , the Black Caps crept in as they went on to dismiss Shafiq and Younis quite cheapily, bringing Pakistan to 106-4 by 13.5 overs. From here Umar Akmal and Shahid Afridi lifted off the run rate, playing shots across the park,until Afridi who was trying to improvise on the leg side , had only his leg stumps exposed for Southee hence paying penalty .After almost a silent 18th over, Pakistan went to rage Black Caps as barrage of boundaries come along, in process Abdul Razzaq was lucky to survive with a dropped catch. After that there was no looking back, as they went on to produce 31 runs off last 9 balls posting 183-6. With Black Caps on to bat, faced a devastated blow when top four batsman went for a duck completely breaking their back bone. Abdul Razzaq and Tanvir were the main architects of their demolition, and later Shahid Afridi took the charge and completed the mission with his four wickets. All the batsman got out in single digits, only Styris being a meaningful resistance with his 45 so they were all cleaned out before 16th over. Though they made some impact, before going into the series but the face remains is Pakistan's un-predictability, which always lets them down. Its only time which is going to decide, how things are going to be, for the time being Afridi and his men would need to boost themselves and show similar performance regularly.